Tall Bearded Historic Iris "CASCADE PASS "
Returning home from Wellington and to my delight a solitary stem of the ridiculously early blooming 'Cascade Pass'. Not another bloom stalk in this garden to be seen but I did note that the are a couple in other gardens at home where the irises are starting to set bloom stalks, amazing really, we are still 9-10 weeks away from Masterton's Iris Show. Note the frost damage at the tips of the standards in the Photo. A large white iris with slight ruffling and olive veins which start on the hafts,and cascade down the falls. White tipped beards touched with bright yellow towards the back. Flowers are scented. Now historic and 39 years old it is still an outstanding garden variety. Fertile "Cascade Pass' is unusual as nearly all whites come from a cross of two whites or the cross of a white and a blue and only occasionally do good whites come from the breeding lines of other colours. Cascade Pass pedigree Bang X (April Showers x Molten) which are all Tom Craig introductions and are detailed as follows. 'Bang' is a Cedar red brown. The yellow and white fancy plicata 'April Showers' was crossed with 'Molten' a rosy brown violet blend and the resulting seedling became the pollen parent of which the colouration is not described. That aside and quick browse of the checklist, the most likely source of the white is from 'Los Angeles' which is few generations back in 'April Showers' genetics, but I'm only speculating. Bulletin of the American Iris Society, January 1975, Number 218. Nineteen from Region 15 Sanford Roberts. Two ladies from the San Diego-Imperial Counties Iris Society have given us two fine introductions in the past few years. The late Mrs. Ruby Cooper combined Bang X (April Showers x Molten) and gave southern California the large, ruffled white CASCADE PASS that blooms all year in these parts. It is usually exhibited from January through the late June iris shows and then comes right back for the November shows. Lois Weaver gave us the lovely Pacific Coast Native NATIVE JEWEL--a most enjoyable wide, light lavender. Bulletin of the American Iris Society, July 1975, Number 216. Saturday: Pilley, Oak Trail, and Cordon Bleu gardens. Rena Crumpler, Virginia. CASCADE PASS, Ruby Cooper '72. I had not seen this last one before but it was very white and cool with deep gold beard, white tipped, and some green and a hint of lavender in the throat. CASCADE PASS (R. Cooper, R. 1970). Sdlg. 68-1 B X (A S X M). TB 45" (116 cm) M & RE. S. white; F. white with light yellowish green midribs; strong yellow-green markings on shoulders and throat; beard deep gold in throat, tipped white; very pale purple wash in entire throat. Bang X (April Showers x Molten)., Cordon Bleu 1972. Architecturally, Wellington, is a really interesting city. Yesterday on my way to meetings I passed the City Gallery Wellington which is currently closed due to construction of additional two new galleries and the interior upgrade of the existing structure. The new addition exterior rainscreen is a cladding of open metal webgrate . The material used is manufactured steel which has no protective coating, exposed to the elements it will of course rust, changing the initial colour from orange-brown to eventually a dark brown in colour. An interesting concept which contrasts well as a addition to the Gallery's original 1930 building. The Gallery is expecting to re-open late September 2009. Landscaping around the new stuctures will be interesting on completion. Well done architecture+ for thinking outside the square. A cyclamineus hybrid, 'Emperor's Waltz,' a charmer in yellow and orange, blooming just inside the gates at the Wellington Botanic Gardens. This cultivar backswept appearance of the petals are a feature. It is shorter growing and flowers before the larger cupped Daffodils. Today at The Wellington Botanic Gardens, just one of many amazing plants in the fragrant garden, masses of hanging tassels of sweet-smelling yellow green flowers on bare branches. The Spike Witch-Hazel new leaves will be a rich purple colour, turning bluish green with maturity. The plant also puts on a Knock-out display of Red to Orange leaves come the Autumn. Truly a plant that has learnt to Multi-task. A Certainty for the"Must get list"
Sunday before lunch at the very fine 'Scopa Caffe Cucina,' we visited the very wet Wellington Botanic Garden, which had suffered from very heavy overnight rains and wind, but all the same, its a great shot of spring anticipation with the tulip beds heaving the soil in the race for Tulip Sunday (This year its 27th September). The early Magnolias took a some real punishment and lost about 40% of their bloom. Tall Bearded Iris "HARMONICS "
Harmonics is a mid to late season flowering plicata and presents the ultimate contrast, not just the blue and white distinctive plicata pattern, but as an excellent example of the advances made in modern plicata breeding. Really good bud count on strong well branched stems, with a slight sweet scent. Pollen parent to Barry Blyth's 2000 introduction 'Painted from Memory'. The Blyth family has a long history of hybridising good quality plicata's in the blue and white colour range that quickly become classics's. 'Sapharine' another Blyth classic that I grow and possibly one of the great underrated blue and white plicatas of the last century. Australia has a great depth of plicata breeding which got of to a great start in the 1930's with Mr Aylett and his 'City of ' plicata series. His iris with its lost registration 'City of Armadale' was widely distributed in Australia and also used in plicata breeding. 'Harmonics' ( Blyth,94 Aust.) M-ML 38" A complete delight to us each year it flowers. Standards are white heavily overlaid and stitched light blue so that hardly any white shows through. The Falls bright white with 1/2" stippled edge of deeper blue and hafts are slightly deeper again. Beards are lemon white. Form is what makes it. Touching hafts on full wide ruffled flowers. Super branching make it an excellent show iris as well as a great clump of colour in the garden. This has a full sister for release in 1996( Some Are Angels ) that is pure white recessive that is also spectacular. HARMONICS ( Barry Blyth, R. 1994). Sdlg. Z62-1. TB, 38" (97 cm), ML. S. white, heavily overlaid and stitched light blue; F. white, 1/2" stitched and stippled deep blue edge, deeper hafts with violet tone, flared and ruffled; beards whitish, lemon in throat. W56-1: ('Lipstick Lies' x 'Light Beam') X 'Snowbrook'. Tempo Two 1994/95. I see that my two clumps of the historic plicata 'Los Angeles' have shown good growth and could flower for the first time this season so it will be great to post the photos to show the progression of size and form of the last 82 years in blue and white plicata hybridisation. New Zealand Tall Bearded Iris "ARGOSY "
Another delightful Iris from the Late Jean Stevens. This photo was taken at the garden's of, Mary Greaves the Treasurer of the Masterton Horticultural Society, who has a very fine collection of Historic Irises. Argosy, is the pod parent of the very early 'Phantom Gold', and it's later flowering sib 'Random Harvest'. An exceptional brilliance of colouring entitles this novelty to rank amongst the brightest Iris we grow The Standards are a pure glistening rich gold. In the falls the same gold is flushed with rich brown, a bright gold beard gives the finishing touch to a luminous colourful flower. Good form and substance. Golden Hind X Beowulf. ARGOSY (Mrs J. Stevens, R. 1944). Sdlg. 1/P59. 36" TB, M, Y9D. It took until this afternoon to get the shot in the sun. This tiny Iris tolerates either sun or shade. Blooms late winter early spring.Only 12 cm in height with a great primrose scent. The narrow almost square spear like foliage is very unique in the iris world. Bulbs are readily available late summer from regular plant stores and Big Box hardware Chains. Planted in the Autumn, 10cm deep in small clumps. They are perfect for growing in pots and demand very little attention.Keep the pots outside in a sheltered spot until the growth pokes through, when they can be brought inside to flower. After flowering, I give them a feed of blood and bone or a low nitrogen fertiliser and return outside to a partialty shaded spot. For a tiny plant they certainly pack visual knock-out punch. Give them ago. Tall Bearded Iris "LADY FRIEND"
A Colour sometimes described as Toasted Watermelon, Lady Friend is an Early flowering Iris carrying an abundance of bloom is a robust grower and increase is outstanding.Lady Friend is the result of Joe Ghio's long-standing and continued pursuit of the elusive Red Iris. The evolution of the RED iris is far from complete. Becomes another reluctant iris labelled as Historic in 2010. Keith Keppel 1982 Catalog, Irises. Cooleys 2000 Iris Fanciers Standard Reference Book. LADY FRIEND (Ghio 1981) E. 38"
IRISES A Gardeners Encyclopaedia, Claire Austin. Iris 'Lady Friend' (J. Ghio 1980) The ruffled flowers are hard to describe. The colour is a sort of pink red or perhaps is the breeder describes it garnet red. The beard is are bent orange. Height 97 cm 38¾ inches Bloom; very early to early-season. IRIS,Flower of the Rainbow, Graeme Grosvenor. Lady Friend (Ghio 1981) approaches red from the dark pink side, being a garnet rose or garnet red in colour and quite distinctive with its soft coloured beards. The flowers are large and of reasonable form. They are carried on excellent, strong spikes with about seven well spaced flowers that bloom early and continue through the season. Spikes will reach 95 cm in height and are able to hold up well in all weather. 'Lady Friend' is a superb garden Iris in every way, It is healthy, vigorous and quick to increase, seems unperturbed by soil or climate conditions and is an outstanding performer in mild climates. It also re-establishes very quickly and will perform very well on a first year planting. It is an Iris that seems never to fail even when treated quite harshly. 'Lady Friend' is from interesting breeding, Indian Territory X Countryman and although I know of others who have been able to achieve nice seedlings from it, I have been unable to obtain much of quality. When it first released it was thought that 'Lady Friend' would open the door to a range of reds from the pink side, but this has not happened. 'Lady Friend' is an excellent show Iris and has been champion at the NSW Region of the ISA show in Sydney. LADY FRIEND. (Joseph Ghio, R. 1980) Sdlg. 76-126-O. TB, 38" (97 cm), VE-E ; Garnet red; red beard. Indian Territory X Countryman. Bay View Gardens 1981. HM 1983, AM 1985. Last time I posted on my Blog it was July and now its August, how about that. Just where does this year think its going. 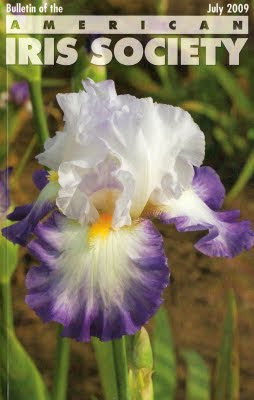 The American Iris Society July bulletin arrived in the post a day or so ago, its another 130 pages of Interesting Iris information. So far this year that's 390 pages published and there is still another Bulletin to come in October. 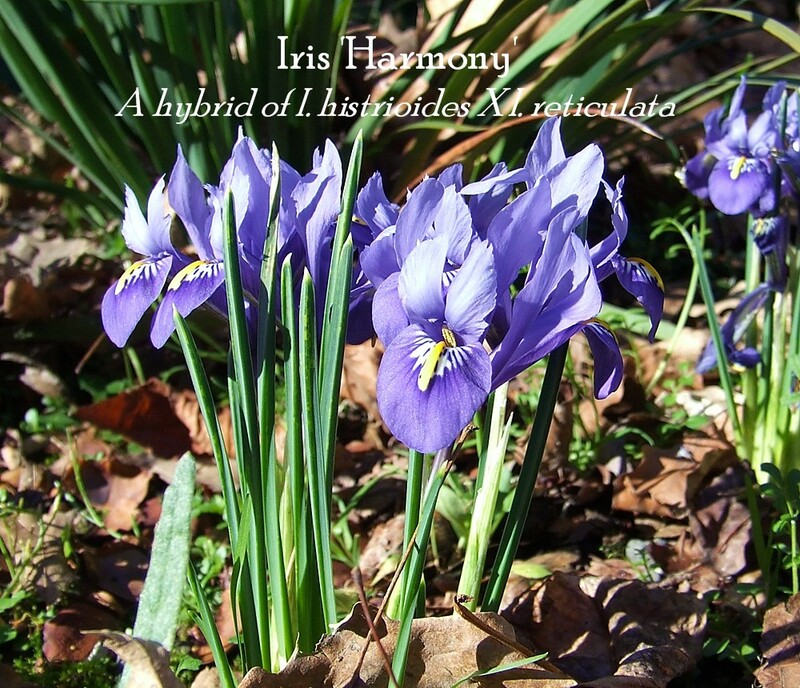 Pat Toolan writes an interesting article on Aril and Historic Iris growing in Australia. Perhaps the 'Out of Left Field" article goes to 'Educate your members to keep them' not sure if this is a new idea but its an idea that has had real success so congratulations. The Editors somewhat puzzling message is with reference to Newspapers and 'Bulletins via the internet'. I will bet that the demand for the Bulletin in the printed form will remain strong even among the so called net-savvy membership for many years to come. The Bulletin is a Reference Magazine format not a Newspaper and following the trend of what happens to newspapers whilst is interesting, it is irrelevant. Most members would agree that reading a bulletin or year book is an informative experience and there is something much more convenient and relaxing about having something in print and not just holding a computer or an E Book reader while sitting in your favourite chair. I was reading an article the other day, (in a real Newspaper) about how the Laptop market had matured and that the laptop manufacturer was looking at the electronic book market for growth but that was still 5 years away. Lets face facts E book readers (Kindle) at US $299.00 ($446.00 NZ Dollars) for a tiny six inch screen, the price would have to move a long way down to get mass market appeal, and personally I not sure I would want to spend the big bucks having to upgrade my reading glasses which would be the inevitable result squinting at such a tiny screen, and paying US $489.00 (A Massive $729.00 NZ Dollars) for Amazons new Kindle DX larger nine inch screen with text in standard E-Ink black on grey is verging on the ridiculous. Some colour screen laptops can be purchased for that kind of money and do a lot more!~!Lets also not forget the sophisticated commercial growers of Irises and their existing websites and all their pages of catalogued Irises and the associated photos. These growers will soon realise that for less than the price of their current print media advertising budget they will be able to divert the spend on good quality weekly editorial content on their web sites coupled with e-newsletters to their e-mailing lists. Visitors will just log in read the latest news on the site, chat on a forum, purchase books, plants, Music or whatever and they will have created the one stop Iris shop with no membership fee obligations or a walled garden. Should these upgraded sites ever become a reality they will be a real threat to any Iris Society not so much to the existing membership but would certainly choke the flow of new and younger sophisticated members to Iris societies. My thoughts are that Iris Societies that really have the chance to succeed and play the endgame what ever that happens to be, will be today offering a strong and informative 'single desk format' web presence, but also will be offering the membership a print subscription with unique quality content that isn't on the web. Here's a few informative sites that are much more expansive and are well worth a read on the E books and the demise of the Newspaper as we know it.